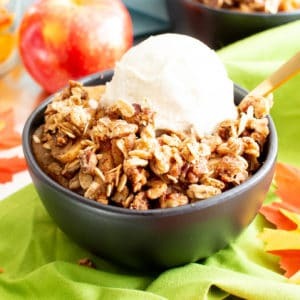 Vegan Gluten Free Cinnamon Apple Crisp with Oats (V, GF): an easy recipe for a warm, gooey apple crisp with delicious cinnamon oat topping. Made with healthy ingredients. 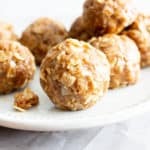 Vegan, Gluten-Free, Dairy-Free, Paleo Option. Do you ever feel like your internal calendar is ridiculously far behind (and simultaneously far ahead of) everyone else’s? Everyone else = the actual calendar on your desk. Apparently, it’s just a few days until the first official day of Autumn! And I sooooo don’t know how to process this. Like, whaaaaa? How is it Autumn already? Concurrently, I’m also thinking: Wasn’t it autumn like 3 months ago? Ah, the life of a madwoman. Erm, a food blogger! Truth be told, I developed and shot this recipe in the thick of summer—and I do mean THICK. The weather was hot, muggy, thick with sweat (ew) and, well, not with a lot of fall stuff lying around. Save for this gluten free vegan pumpkin bread that Erik had to have, immediately. Or else. ???????? Meanwhile, to add more confusion to the mix, Erik and I always joke about the fact that we think fall starts in August (blame back-to-school, aggressively early candy displays that insist that it’s Halloween in JULY, etc., I could go on and on), but it actually starts way later. So to soothe our minds and calm our… everything… I decided to greet fall the best way I know how: with FOOD. Duh!! I mean, I can’t even tell you how these vegan gluten free chocolate cupcakes saved me the other day… I mean, I could, but I’m too dazed to do so. ???? Anywho… welcome to my Vegan Gluten Free Cinnamon Apple Crisp with Oats. It’s warm, cozy, totally time-appropriate (I promise), and seriously so good. I took the reader-fave recipe for my Paleo Apple Crisp and gave it a little twist with a gluten free oat topping. I also kicked up the ground cinnamon to a most pleasing level, and voila! My favorite part? 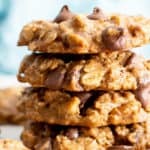 The sweet oat & nut topping—wait, no, the gooey cinnamon filling—wait, actually, the delightful whole ingredients—wait, oh never mind! 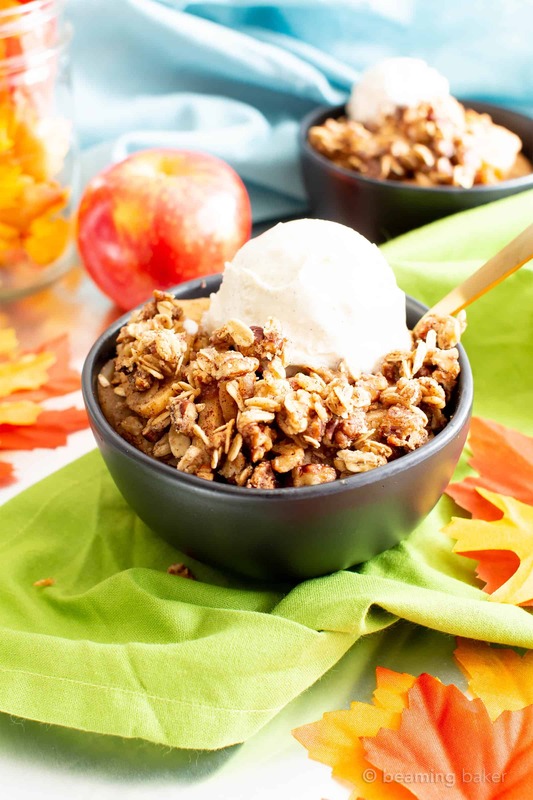 just the healthy apple crisp recipe you’ve been searching for! I truly hope you enjoy my recipe. Why don’t I grab the apples while you grab the gluten free oats? 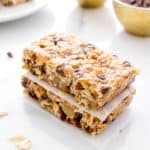 🙂 It’s truly my pleasure to share in these recipes and kitchen moments with you. I hope your loved ones enjoy this recipe as much as mine do! Thank you for stopping by! 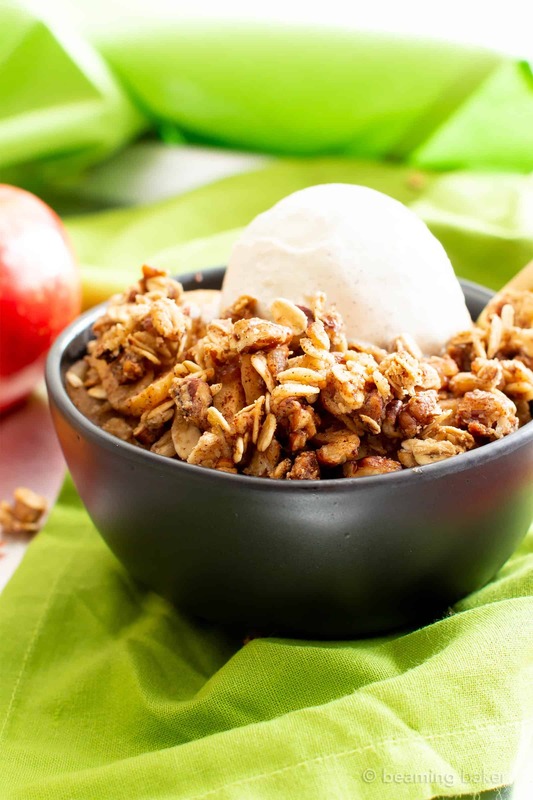 Vegan Gluten Free Cinnamon Apple Crisp with Oats (V, GF): an easy recipe for a warm, gooey apple crisp with delicious cinnamon oat topping. Made with healthy ingredients. 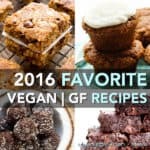 Gluten-Free, Vegan, Dairy-Free, Healthy, Fall Desserts. 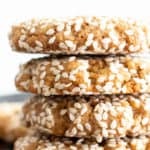 To make this paleo, make the topping in this recipe. In a large bowl, add all Filling ingredients: apples, coconut sugar, maple syrup, almond flour, cinnamon, nutmeg and vanilla extract. Using a rubber spatula, stir and fold until apples are fully coated and sugar has dissolved. If the mixture isn’t very wet, add in water—there should be 1-2 tablespoons of liquid at the bottom of the mixing bowl. I used 1 ½ tablespoons water in mine. 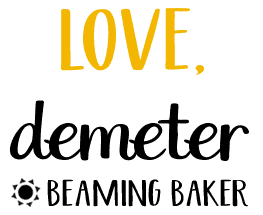 Bake for 40-60 minutes. Mine took 45 minutes. 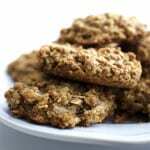 It’s done when the top is a deep golden brown and the juice around the filling has thickened. To test, use a spoon to carefully lift up a corner of the crisp to see the juices. If it's still too watery, bake for another 5 minutes. Adapted from my Paleo Apple Crisp. Also try my One Bowl Gluten Free Vegan Pumpkin Bread. *I like to use a mix of apples: Braeburn, Fuji, Granny Smith, etc. - Storage notes: Best on the first day. Cover with foil, or transfer to an airtight container. Store in the refrigerator for up to 1 week. Reheat before serving. 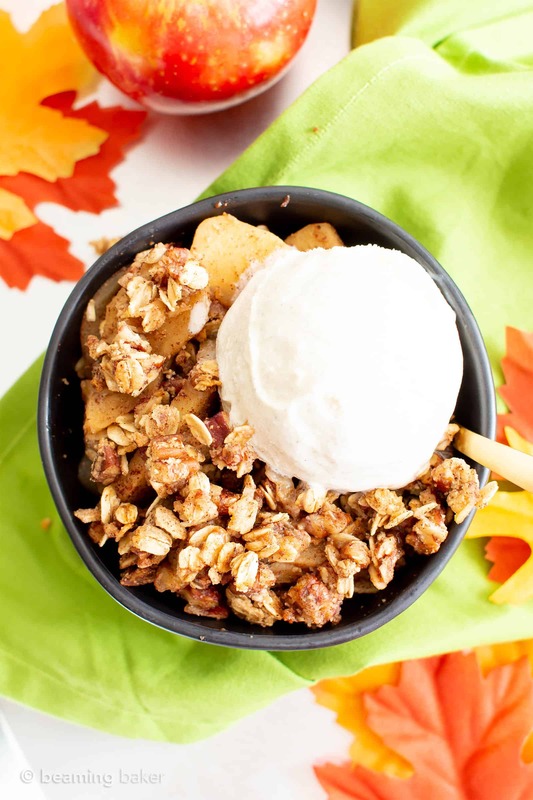 This apple crisp has me craving all things fall. I love that this is great for any eater. Oh yes! It’s time to bring on all the fall fun! I can’t believe how easy this crisp is! It looks delicious! Thanks Cindy! 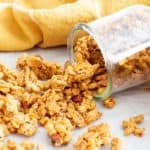 It’s super easy, and soo tasty! ???? Yes! It totally makes the place smell fantastic! ???? Anything that combines the Fall flavors of apples & cinnamon and I’m in. Such a great recipe to kick off Fall with! YUM! Haha you and me both Stephanie! 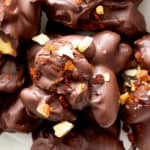 It’s such a great fall treat! This looks so delicious! 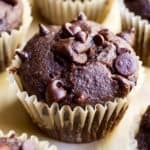 Could I use Coconut flour instead of almond flour? I am so excited to try this recipe! Hi Robin! Thank you! I definitely would not recommend it. ???? Coconut flour is extremely absorbent, much more so than almond flour, so I’m not sure what the results will be. 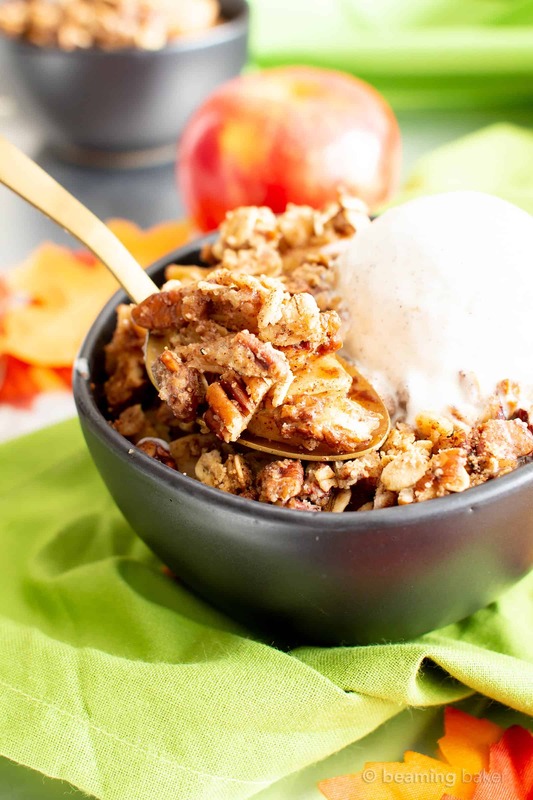 Apple crisps are my favorite fall dessert! So yummy! What a wonderful recipe to enjoy this fall. You’ve got all the essential elements to the perfect fall dessert. That looks so good, I can’t wait to try it! This looks tasty and healthy! 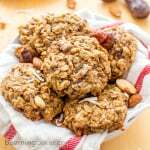 Love how easy it is, simple and absolutely delicious! Such a great combo, right? 🙂 Hope you like it! Oh you know it Marsha! ???? This is such an amazing idea! Looks so good!